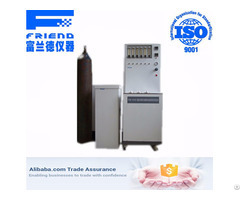 According to GB/T 5654 and YS-30-1-84 standard, after many years of development and innovation, we have designed to reach the international level, the domestic leading full automatic oil dielectric dissipation tester, it is the ideal product to replace the imported equipment. This instrument is an integrated structure, which is composed of volume resistivity measurement, computer communication systems, oil cup and heating control system of four parts. 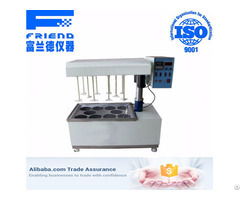 The instrument adopts a fully enclosed heating, the speed of heating temperature is fast, room temperature is heated to a temperature control (90℃) and constant temperature automatic measurement only 15 minutes; it can measure the oil dielectric dissipation and volume resistivity or optional. 1, the oil cup conforms to the standard GB/T5654-2007 three electrode structure, the inter electrode spacing is 2mm, it can eliminate stray capacitance and the effect of leakage on the dielectric dissipation test results. It has oil discharge electromagnetic switch, the operator can remove the sample oil from oil cup under the condition of don’t remove the oil cup, and can clean the oil cup with sample oil. 2, the instrument uses induction heating, PID temperature control algorithm. The heating mode has the advantages of oil cup and heating body non-contact, heat evenly, fast, and easy to control the temperature strictly controlled within the preset temperature error range. 3, the internal standard capacitor is the SF6 inflatable three electrode type capacitor. The dielectric dissipation and capacitance of the capacitor are not affected by the ambient temperature and humidity. The precision of the instrument is guaranteed after long time use. 4, AC test power supply using AC-DC-AC conversion, which can effectively avoid the influence of mains voltage and frequency fluctuation on the accuracy of dielectric dissipation test. Even if the generator is generating electricity, the instrument can run correctly. 5, this instrument has a perfect protection function. When there is over-voltage, over-current, high voltage short circuit, the instrument can quickly cut off the high pressure, and issue a warning message. When the temperature sensor fails or is not connected, a warning message is issued. In the medium frequency induction heating furnace with limit temperature relay, when the temperature exceeds 120 degrees, the relay release, heating stop. 6, test parameter setting is convenient. The temperature setting range is 0 ~ 125 ℃, the AC voltage setting range is 500 ~ 2200V, and the DC voltage setting range is 0 ~ 500V. 7, the instrument uses a large-screen LCD display, with backlight, clear display and so on. 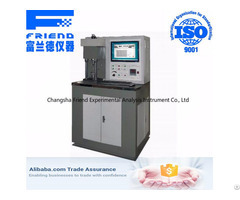 Friendly man-machine interface, just follow the English menu prompts, enter the command, the instrument can be automatically tested. And automatically store and print test results. 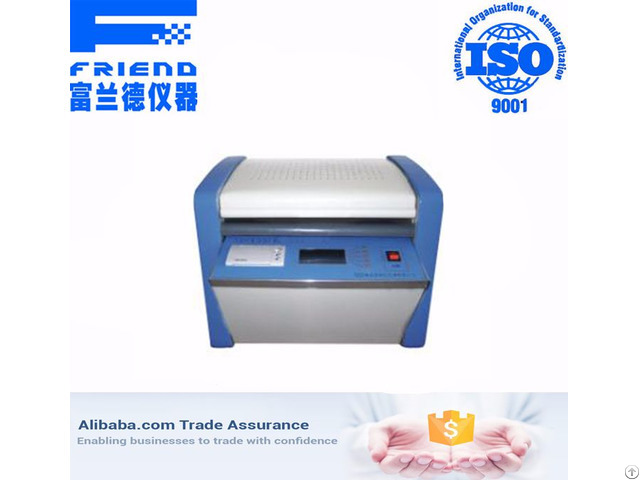 8, this instrument has a real-time clock, test date and time can be saved with the test results, display and print. 9, this instrument has an empty electrode cup calibration function. It can measure the capacitance of the empty electrode cup and dielectric dissipation factor to determine the cleaning and assembly of empty electrode cups. Calibration data is automatically saved for accurate calculation of relative permittivity and DC resistivity.